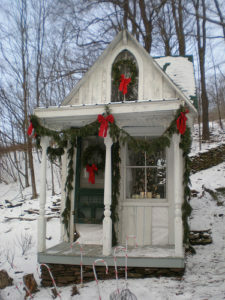 Sandy Foster has single-handedly given new meaning to “tiny house” and to Victoriana in 2010. When I saw the photo of her on the porch of the sweet retreat in the New York Times, I simply had to know more about her and this wonderful mini building. I read that she was a fiscal administrator but how did that jive with this “shabby streamside studio,” as she calls it, in a forest? To learn more about Sandy, check out her website where you’ll notice the amazing attention to detail and get a sense of her eclectic taste. She was kind enough to quench my curiosity recently and answer questions about how and why she created this unique treasure. 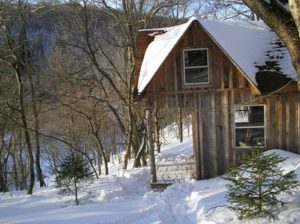 THE WOMEN’S EYE: What truly inspired you to build this very private mini house amongst the trees in the Catskill Mountains of New York? SANDY: I’ve always wanted my own little Victorian house. 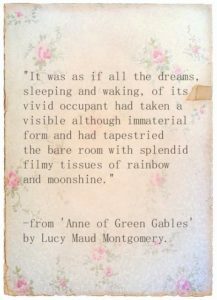 Reading Lucy Maud Montgomery’s Anne of Green Gables as a child was the beginning. Visits to my grandparents’ old home charmed me in ways 1970s ranch homes never did. I was homeless as a teenager. My father tried to start his own businesses; none of them worked out. Coupled with substance abuse problems, our family moved around too much. It’s particularly tough when you’re the type of person that really cleaves to their home like me. The first house I bought was a 3,000 square foot farmhouse that I did radical things to (like making the 3rd story hip style gables into pointy gables nearly 30 feet off the ground) to make it look Victorian. It was under renovation until just before I sold it. It never felt like home. I always pondered why certain Victorian homes gobsmacked me with their beauty, while others were merely pretty. For years I thought it was the ratio of windows to wall space. One morning I spied the sweetest Victorian next to an antique shop and it finally struck me: my favorite Victorian homes were small. At 38, I was tired of working two full-time jobs and renovating on the weekend. I shelved my artistic side for nearly 20 years, but without the freedom to work less I’d never have the time. So I decided to downsize to the point where I wouldn’t have a mortgage, thus affording the opportunity to live in the country. EYE: Did you have a vision immediately of what you wanted your “shabby streamside studio” to look like? SANDY: Yes, I have a file of pictures I’ve collected since I was homeless of my ideal Victorians. My cottage is a synthesis of my favorites. EYE: Was this idea a result of being homeless as a teen? SANDY: Yes. I learned you can’t rely on anyone to get and keep what you want in life. My mom was a stay-at-home mom and didn’t work. I knew I had to be independent, because your mate can really mess things up if he’s not good with money. My husband lost the house he owned when he tried to start businesses that didn’t work out. That set the stage for me keeping my money and property separate and in my name. Over my dead body will I lose my home because someone else screwed up. EYE: How important is it for you to be surrounded by beauty and roses? SANDY: It’s critical because I get depressed and anxious otherwise. The outside world can be unwelcoming. I need a place where it’s always welcoming. EYE: You’re a fiscal administrator by profession. Yet you rebuilt this mini structure almost all by yourself. How did you have the guts or knowledge to do it? SANDY: I don’t know that it takes guts to use power tools and schlep lumber up a mountain. It’s plain old-fashioned work. That’s all. I learned carpentry from my husband, library books, and the internet. Experimenting with different tools helped. There’s more than one way to nail wood together. I still stink at nailing with a hammer. EYE: Were a lot of decisions based on cost? You spent about $3,000 on this project. Is there anything you really wanted to do or put inside that you simply couldn’t afford? SANDY: Cost definitely shaped the project. I didn’t get what I needed when I sold my house in the declining market, so the money came from the yard sale I had before moving. The balance went on my Visa, which I’m still paying off. I want a pair of French bergeres in a pale pink velvet, long pale pink silk curtains, and an old chandelier in my loft instead of the internet one I bought. I really want an addition for a kitchen, screen porch, and bath! EYE: The studio has such beautiful lighting. Did you do all the electrical work too? SANDY: Yes, I did, but I kept it simple. I learned how to install outlets and hang fixtures from my husband. Those tasks are so easy that if most people knew how to do it they’d be sick with remorse for forking over so much money to electricians. It’s powered from a line hooked up to our panel far below, and I connected it to an exterior plug box. Everything inside is run to a zip strip under the porch step. I’m a purist–I don’t care for the way outlets and switches interfere with 19th century interiors. I installed electricity mainly because I wanted holiday lights in winter! I was going to be radically anachronistic and not even have electric when I started out. EYE: Your attention to detail is mind-boggling. 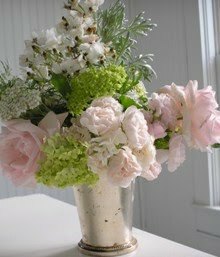 You search high and low for just the right items at just the right cost that blend beautifully into their surroundings. Describe what you look for. SANDY: Well, a part of that was a given. When one boils down the contents of a large home into the attar of what one is besotted with, it really resonates. It also fits where you want it because you’re familiar with it. I look for things that are actually old. You can’t beat that. I look for neo-classical motifs, and the feminine lines of French design. EYE: You walk across a stream to get to the studio. That’s quite a challenge both in building and furnishing it. Did you consider moving it or building in another spot? SANDY: You have no idea. 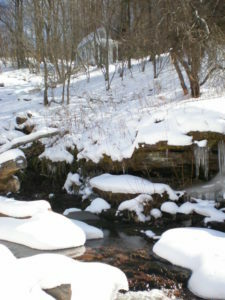 Every piece of lumber, every door, every nail, everything had to be carried across the creek. I don’t back down from challenges. mountain across our clove is particularly lovely, and there’s a pair of old apple trees that would be alongside the house. But, you can’t see the stream from there, and it’s so shady it would require the removal of about a dozen huge trees. My husband and I are always behind on firewood, so the lumber would be ruined. And the building would cost more money. EYE: You’ve been criticized for it not being “practical.” Do you ever think of this project in terms of practicality? SANDY: No. Practical is boring. I have practical at work, my car, my job, my community, my bills. This is my atelier. I could care less what anyone else thinks. I hope to make it more “practical” in terms of more space (kitchen, bath, screen porch) someday, but I can’t afford it yet. SANDY: I identified with the protagonist: an unattractive child without a real home. One summer, everything changes for her. She gets to live in not just any home but a beautiful Victorian in a lush country setting. The “east gable” is the spare room given to Anne. It’s white and the walls slant, just like my loft bedroom. The book is special because it’s 90 years old, tattered and pre-loved, and made with the kind of care and attention to detail we just don’t see any longer. EYE: What is winter like in your house? I saw a photo of it in the snow and it was absolutely beautiful. SANDY: It’s so cold I have to flip the switch to turn my space heater on (it’s down below at our cabin) for an hour before I hike up. I hoped to install a laid-up stone fireplace this summer, but I had to go back to work full-time to get my flabby finances in shape again so it didn’t happen. In such a tiny space an inefficient heat source such as a fireplace would work. My husband and I did it in our 300 square foot guest house while we renovated our big house. EYE: Another unforgettable picture shows it decorated for Christmas. 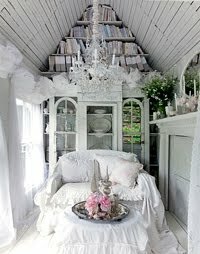 It looks like a fairy tale house. Does Christmas have a special meaning to you? SANDY: I’m crazy about the holidays: the music, the decorations, the goodwill. The holidays are all about homecoming, but in my teens and twenties I dreaded it because I hated returning to a dysfunctional home. My family has healed nicely, and all of us are drawn together during the holidays. So, the holidays represent forgiveness, merriment, and celebration. It’s not for nothing they’re held at the darkest time of the year. So many homes display lights on dormancy defying evergreen boughs to lighten the gloom. To me, the world appears to be all over this idea for a month and I find that incredibly beautiful. EYE: You are married to Todd Foster, and your home with your husband is close by. I think readers would want to know how this tiny house has affected your relationship? I think he has his own “man” space. SANDY: My cottage and his man cave are a pressure release valve. Gender stereotypes aside, we’re polar opposites as far as home keeping is concerned. When we shared a large house, I was always frustrated and angry at how sloppy he was. And Todd was always irritated by how neat and organized I was. That issue has been surgically removed from our relationship. We’re infinitely happier, and our creative sides are blossoming because they aren’t dampened by our very living situation. EYE: This house has given you a new-found popularity with the media attention it’s getting. Has that been a good thing or would you rather have more privacy? SANDY: It’s a good thing. It’s not rock star fame, although I do get recognized in town and at yard sales! I’ve always wanted to write books, and the media exposure has opened the door for that. EYE: Your Maltese pups Little Miss ZuZu and Belle along with Todd’s dogs Ruffy and Momo are pictured on your website. How important are they to you? SANDY: Oh, they’re our children. We never had kids. EYE: Do you recommend this type of retreat for other women? Can most people actually build their own sanctuary? SANDY: Absolutely. I think many women are frustrated by the lack of a place they can truly call their own in their lives. As much as you love them, you must compromise so much when you have a mate and children. As much as you love your career and community, the responsibilities from them can suffocate your “inner girl.” It’s a balm for the spirit to have a place where I’m free to do what I want. Like a tree house you run to as a kid and pull up the ladder once inside. Any able-bodied person can build their own sanctuary, providing they have the location, money, time, and tools to do it. Few are the instances in remodeling where a second pair of hands is needed. You can hire someone for that. I only needed my husband’s help for two and a half hours when the porch roof’s infrastructure went up. EYE: What’s the most important thing you’ve learned building your wonderful little studio? SANDY: When you’re setting window sashes in, it’s best to get the first screw into the casing all the way in so you can let go and get it plumb and square before drilling the rest of the screws, ha ha! I suppose this is where I say something profound and rousing like, steamrolling your dreams into existence and hard work is so powerful it’ll change your life. But, the most important thing is that I chose to share it instead of hiding it. The feedback I get from people that were inspired is so touching and validating. QUESTION: Do you have your own special retreat? I so much enjoyed reading about your cottage. 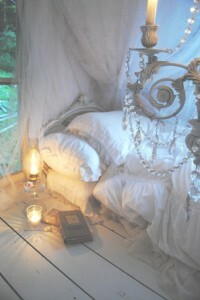 It is so adorable, like a fairytale. I would love to have a place like that to escape to where one can be alone with their thoughts and dreams. You have magically transformed this little house into a castle! Love your style. We, too, love Sandy’s retreat. It’s a wonderful little getaway, so beautifully decorated. Thanks for reading this story. Glad you enjoyed it! While in photography school a friend of mine sent me a link to your blog about your Streamside cottage. My eyes were opened wide and I bought a 1900 two story cotton mill house in the town I grew up in. Your spirit was with me always as I turned my visions into reality. I had asked my husband prior to buying the house if I could rent an apartment for a year to buy furniture at yard sales so I could have a place of my own while still living at our home. He thought I was crazy but I knew what I needed; a place I could call my own. I’m currently taking care of my sister who is under Hospice care in my home. ‘My Treehouse on Cotton Patch Lane’ is waiting for me to landscape and and stain the back deck. I’ll be planting my third crop of cotton in the back yard this year. Did you know there is brown and green cotton? I hope to start a new blog soon about My Treehouse on Cotton Patch Lane. My mind has wondered about you, particularly after the fire. My heart was so saddened as everyone else’s. Just know I have been thinking of you thoughtfully.